Wide tonality. Cedar tops sound great. Amara back/sides looks stunning. Price. Tanglewood's new Indonesian-made electro acoustics seem to offer remarkable value for money. Too good to be true? 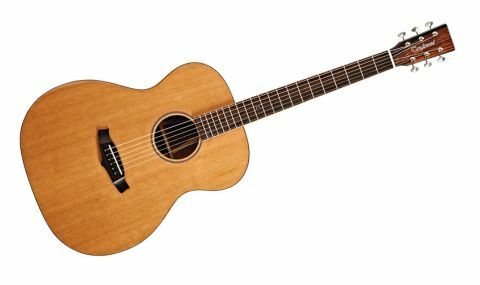 We investigate the Java jive behind its latest folk-sized model, the TWJF E.
Reporting from the floor of Frankfurt Musikmesse earlier this year, we were overwhelmed by the number of lowly priced and very familiar-looking acoustics and electros on show. Doing something different in this cut-throat market sector is difficult, but Tanglewood has a talent for tempting us with low-price, attractive and engaging guitars. The instruments are all designed in the UK and made in Asia, with the exception of the Master Design models, which are conceived by Michael Sanden in Sweden. "The electro here is a highly competent build"
This new Java mini-range is typical of Tanglewood and consists of four guitars: a parlour and folk in both acoustic and electro versions. Like many brands, Tanglewood has ukuleles within its range and the Java ukes come from a specific factory in Indonesia. So impressed was Tanglewood with the quality of the ukes, not to mention the wood choice, it commissioned these steel strings from the same facility. The result? Classy instruments whose prices belie their boutique looks. The electro here is a highly competent build. The tan-coloured solid cedar top exhibits a close, precise grain with a thin rosette ring inlay and what appears to be mahogany binding (also featured on the fingerboard edges) with an inner purfling strip. But it's the striped, rosewood-like amara sides and back that are the real talking points, with vibrant figuring and deep dark-to-milk chocolate colouration. The back has an insert of spalted mango with clean purfling inserts - there are even spruce strengthening strips inside the guitar along with clean spruce X-bracing and a traditionally kerfed lining. The three-piece neck, which joins the body via a traditional dovetail is a slightly flat-backed, thin 'C' profile. You can't expect a perfect fret job in this price range, and although it's tidy enough, there are some sharp-edged ends and slightly rough crowns that give a mildly scratchy tonality to bends. The downside of the relatively light mahogany fingerboard binding is that the small side dots lack contrast and make you think a little about your positioning, especially when switching between the 12-fret parlour and the 14-fret folk necks. Bridge spacing is generous, however things are less spacious at the nut - it's not ideal, but it does give the guitar quite a mainstream do-it-all feel. You wouldn't expect a bone nut and saddle on a guitar at this price, and here it's classed as PPS (polyphenylene sulphide), a seemingly quite hard plastic that's very Tusq-like in appearance. The guitar is very nicely finished, too. As you'd expect, the polyutherane is a bit over-egged and a little too shiny for our tastes. You can't help thinking that a Lowden-style 'posh' satin would really suit. With a relatively trim depth, the guitar feels very comfortable played seated. The folk (aka 000/orchestra) body feels fairly expansive. For many players, however, it remains the 'perfect' size: compact enough for practice and comfortable performance, big enough to balance a fairly deep low-end with smooth, clear but rounded highs. "The cedar top brings a sweetness and roundness to the high-end delivery that's ideal for older styles"
Visuals aside, the back and sides seem to sit tonally between mahogany and rosewood 'norms'; there's warmth, but not at the expense of separation and clarity. The cedar top brings a sweetness and roundness to the high-end delivery that's ideal for older styles. It's one we'd recommend if you find the often brittle high-end zing of modern spruce-topped guitars a little ear-wearing, also if you have a light-to-medium picking/strumming style. The folk has a wide tonality that really suits dropped tunings. It's a very affordable entry into the world of the virtuoso picker and an excellent place to hone your chops before you can justify that Lowden O. Plugged in, however, it is very uneven with the B, G, and even the D string noticeably lower in output than the other strings - clearly an oversight. The onboard tone control is of little help, simply offering some high-end reduction or enhancement. Either from an outboard preamp or amp/PA EQ, be prepared to tweak. Still, it's important to put this side of the guitar into perspective. You might think buying the cheaper acoustic version and retrofitting your own pickup would be sensible: we were pondering just that until we realised something such as LR Baggs' Lyric bridgeplate microphone costs around two-thirds of the price of the guitar itself! Can a sub-£400 electro really compete with a 'boutique' brand? No. But this Tanglewood puts on a good front with superb wood choices, competent build and lovely looks. It could do with some fingerboard and fret love, and we didn't find the nice-looking tuners that responsive, especially if you're changing tunings every other song, as many of us do. Also, the mid-heavy voice needs work with outboard EQ. As a pure acoustic, however, it would be a great addition to your collection, would look very 'posh' on a stand in the living room and - more importantly - make a very useful, robust- sounding, good-looking practice, songwriting and recording tool.